Equipment looks cheap and results of 15 dollar wash are like a good rinse. EXCEPT that their wax seals in the stuff that needs a bit of a scrub. Ive gone to this location since it opened as it is next to my house. I finally complained when my jeep came out dirty -- I did not want to wax in the dirt --- the service attendant was argumentative and refused the rewash. Oh, he was so rude and made me walk away feeling like an a-hole for asking. I called and complained about my experience and emailed the manager. I offered to meet with him and the service person. No one got back to me. We went through the machine car-wash and it did a horrible job of cleaning the car. We turned around and went in for a second run, they have a policy that if your machine wash doesnt satisfy you, theyll wash it by hand, so thats what we did. The guy took his time to wash it well, so we cant complain. It definitely took longer than anticipated but we left on a clean car. Automatic car wash is not functioning, and wont be back at all, what a waste of twenty bucks for the "best" wash. I am sitting here watching the sprays just go around in circles doing nothing. Id drive away right now but I cant while they are in motion. Havent used the automatic wash. For self serve, location is very good; plenty of available wash bays and lots of vaccum/hand dry bays as well for afterwards. Machines equipped with a digital timer to show you exactly how much time you have remaining. 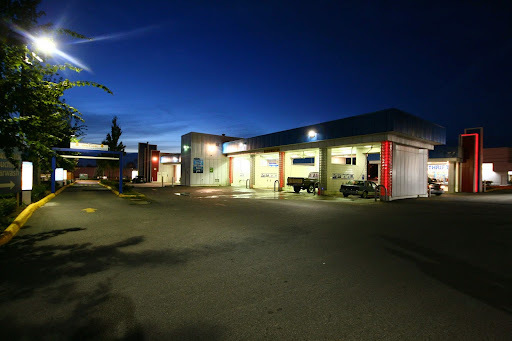 Probably one of the better car washes on the lower mainland (that Ive used) but it could use some updating. I havent used the drive thru but it seems quite popular compared to the self wash bays. Generally clean and maintained. Spent $18.00 washing my car by hand only to have the wax not rinse off when I rinsed it. Talked to the attendant who wouldnt do anything for me. Forced me to pay $17.00 to rewash it in the automatic car wash. Never going back. Good price, lots of soap, water DOES NOT SMELL LIKE DOG, unlike other places. Vacuums are decent. Change machine is pretty damn finicky, cant use folded bills. This has become my go-to car wash.
Great facilities, except for one wash stall has a spray gun attached to a rope that is hard to manoeuvre quickly, which irritates me when youre paying for time. Touch-less vending machine not working properly, however: the service attendant did his best to help... I would go back and give it another go. Good place for self washing cars and can do detailing. Careful at times vending machines eat off coins without giving selected product. the luxury wash at the shell on 104 and 152 is miles better than washworlds automatic wash. few bucks cheaper too. Handily located car wash and oil change garage. The facility is kept clean and is reasonably well laid out. Im give a 2 start rating because the last 3 times I was in there many of the wands were broken. Leaks everywhere. Those machine need better técnica service. They ate my coins. For the most part it is clean and the machines work very good. The worst car wash I have ever used, no question about it. Machines do not take credit card for the self wash.
$20 for half working touchless, not coming again. Good place to do your own car wash and cleaning. Id go back for sure.